Honorarkonsulat Englisch | Sweden is Music! 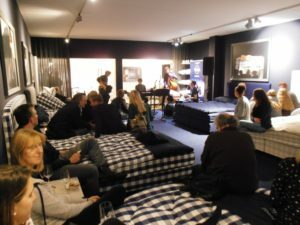 This is the title for the Germany-wide Jazz Award contest for young talents hosted and organized by all Hästens stores. The small concert in Hanover took place on November 11th. Managing Director, Oliver Glinski, was looking forward to an eventful evening in the Osterstraße. Young talents Johanna Schmoll and the Aaron Luther Quartett presented two very different performances to entertain the guests. After their performances, the guests voted for the talent they enjoyed most. The same procedure will be conducted at the other branches and in the end, each local winner will stand in front of a top-class jury who will select the final winner. That talent will win a trip to Stockholm including a concert in a jazz club. Mr Glinski was happy with the event: “It was a lovely evening and we saw once again that Hästens in Hanover is very well suited for musical presentations as well.” Honorary Consul of Sweden, Mrs Jasmin Arbabian-Vogel was also thrilled that Hanover has once more proved itself worthy to carry the title UNESCO City of Music. This time even under the Swedish flag! The final winner can soon be found here.